You have probably seen this image, splashed everywhere by PETA and all organisations that want to ban animal tests. 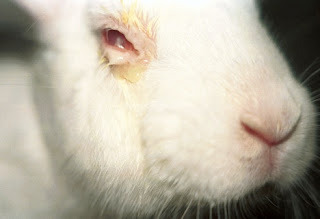 Rabbits (whose symbol you see on your makeup jars/ tubes)are generally used for testing eye products. The reason for this test to become a standard protocol was that a lot of people going blind due to coal tar in mascara in 1930s. So the problem began with makeup in the first place, and now we are going to ban animal testing for beauty products. I am genuinely not sure what has changed that assures us that the mascara made of components not tested on animals will not harm my sight. Also why dont the organisations that protest testing on rabbits never tell you that the testing began because some people went blind after some coal tar was used in mascara. The least these organisations can do is to maintain complete transparency. It was probably tests on rats that revealed that silicones are bad, SLES have adverse reactions and what nots. So why is everyone making such a big deal out of animal testing. Where is this entire animal testing = cruelty=bad equation come in. A lot of products I notice say ‘cruelty free’ somebody please define cruelty for me. Is cruelty restricted to testing on animals, does it not extend to ethical sourcing, lesser environmental impact. The problem with animal testing comes in when there are no guidelines for how are laboratory animals to be treated. I am all for testing, but I would never support cruelty to animals. To me these are two very different issues. A lot of emotional b**** , peddled by (no prizes for guessing) cosmetic companies that do not have a laboratory. I appreciate the ability to turn a negative into a positive. But I still call a spade a spade. And I would never buy mascara from the companies who don't have a laboratory. In US there are guidelines (AAALAC) and detailed ones at that about how animal testing should be done, how should the animals be housed and so on. Simply put it ensures that laboratory rats are treated with complete dignity. We need an organization that ensures that ethics of testing on animals are maintained and publicly disclosed. A lot of people ask but do we really need to put shampoo on a monkey to know it is safe for us. Hmm good question. But would you rather find out while having your shower that there are some extra strong chemicals in the shampoo that are causing your hair to fall, or change colour or feel like straw. We have animal testing for all the drugs we use, what the hell, every drug we use is tried on a lot of other patients before it is deemed fit for your consumption. Should I stop taking medication because I don’t know the ethics of the clinical trial on human beings. A lot of human beings who become clinical trial subjects have no idea they are on a trial, they are just told they will get free medicine, in exchange for agreeing to giving blood samples on a regular basis so that the doctors may know how a drug is working. Most clinical trial subjects are too poor, or have tried everything and failed, and have little to lose. Yet how likely are you to buy a medicine that says we don’t test on humans and/ or animals. Your cosmetics , believe it or not, also make their way to your blood stream, often your nervous system (if they are the strong smelling types even your respiratory system). Are you really willing to try cosmetics that are not tested on animals on your self. I even went to PETA to see their take on animal testing , here is what they said. Instead of measuring how long it takes a chemical to burn away the cornea of a rabbit's eye, manufacturers can now drop that chemical onto donated human corneas. How many companies have access to human corneas, how easily are these available. I don’t know the answer but the question is worth asking. I found a site that makes a beautiful argument about the viability of moving away from animal tests. They (companies) can also choose to use ingredients and chemicals which have already been proved to be harmless and are known to be safe. My problem with PETA is they describe how badly animals are treated in laboratories and end with a conclusion that reads, therefore end animal testing. Why don’t we grade facilities that carry out animal testing, put in place guidelines to ensure that products in concentrations which we know are harmful are never tested on animals. SLES might be very harmful in high concentrations, it should be obvious it should not be tested on animals in that form. 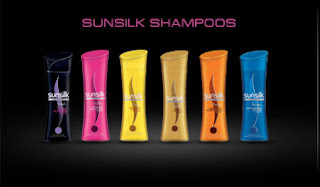 But what comes to me as shampoo, might probably benefit from a trial to ensure that no new chemical reaction has occurred in the shampoo that might lead me to losing my hair, or developing some horrible reactions with repeated use. PETA names some companies that test on animals and are AAALAC accredited as working with PETA to end cruelty. Why does PETA not direct us to AAALAC that takes a more rational approach to animal testing. I don’t know. But I do know a rational argument would somehow not work as well on people who take a holier than thou stand when it comes to animal testing. I am not saying what I am saying is correct or that animal testing is the next best thing after a zipper, but what I am asking each of my readers to do is think things through read up other opinions and research to see where they stand with respect to animal testing. Why should a makeup company tell you if animal testing is good or bad, as beauty bloggers we should do our own research and make up our mind about animal testing. Excellent and very thoughtful article. @supriya- thank u for liking this. i was earlier worried that i might offend people who paid a premium to be 'cruelty free' but the point was only to dig deeper in the debate so each one could think about their own choice. I have tried my best to pick up products that are not tested on animals. Two months ago, I adopted a 4 year old beagle girl, who has spent her life in a cage being tested up on in a pharma laboratory. Her vocal chords have been sliced off so that she couldn't squeal in pain, she was an emotional wreck when she came home. Ethical treatment in her case would mean what? Inject her with toxic drugs. Pat her on her head. Draw blood day in and day out while saying "good girl"? This is when I dug deeper into the whole issue of animal testing and have been horrified by what I have dug up. Yes, it is hard to say no to pharma drugs when the situation arises. But to torture animals just so "your hair doesn't feel like straw" is just plain cruel. When so many companies make fantastic products at reasonable prices, without resorting to testing on animals, I don't see why the others cannot follow suit. And it's not just bunnies or rats that are used for testing, you have monkeys, cats and dogs (beagles in particular). Watch this video and tell me that somebody like this little girl deserved to be tortured so that your hair wouldn't feel like straw. companies , largely the cosmetic ones, which dont really 'discover' but just use it in varying combinations, need to use the existing knowledge about the ingredients, there is no need for a fresh slew of tests. the answer really lies in pushing for more transparency in terms of why the companies undertook animal testing in the first place. in case of pharma as you said , the animal testing is more or less unavoidable. there are two things we need to push for, increased transparency on why a certain company felt the need to test product x on an animal. and how did they make sure the animal wasnt treated unethically. so everytime a company makes a claim laboratory tested so your hair doesnt feel like straw, we need to ask them for a justification. banning animal testing somehow is not the answer. probably giving more AALAC might help. Countless thousands of products -- cosmetics and toiletries -- sell lies and nonsense to consumers, vying insanely with each other to promise some kind of transformation in one or the other part of the human body. So-called beauty experts ride the same bandwagon, all counting dollars as they go. There have been wonderful herbal products in existence since time immemorial in every old culture, that have worked very well indeed for humans. (But, of course, they're not famous international brands backed by expensive advertising.) This collective knowledge, gathered since the beginning of civilisation, is the only reference book any beautician needs. Now there are well-known brands, too, that are as effective and successful, without finding it necessary to torture some poor, defenceless, voiceless creature. As for allopathic medicine, it's pretty much the greatest rip-off act of all time. Most lab tests conducted on animals are inconclusive and many of them have resulted in products that have had nightmarish side-effects. 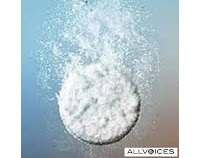 Every few years, a drug that was launched with worldwide fanfare is withdrawn, because it did things it wasn't supposed to. All this is just bare-faced commerce, motivated by the rustle of hard cash. Animal experimentation is cruel, selfish and greedy. Stop fooling yourself. in india most companies make products without testing on animals, either since they are herbal and cannot really cause adverse effects, or that the company is too small to have its own lab. but honestly , how many indians are buying local cosmetics. also i wonder if ppl knw that a lot of brands that claim to be cruelty free, say body shop , are owned by cosmetic giants like loreal which are openly supporting animal testing. animal testing in pharma is a different debate. adverse effects in humans do occur after drug trials, which is why drug trials have been done in phases, if it is safe on animals , then try on humans. eliminating animals from this cycle simply means a lot more ppl die of adverse effects. and as you yourself mentioned 'Every few years, a drug that was launched with worldwide fanfare is withdrawn, because it did things it wasn't supposed to.' what this points to is that even trials on human beings are not full proof. there is always room for error , be it animals or humans. should we then ban drug trials, and ask companies to simply launch drugs in the market after basic tests in laboratory and then wait and watch if something bad happens after consuming the drug. i support the use of home remedies and herbal products for beauty purposes, but i am not sure if herbal products can be used to treat cancer and other diseases. The virtue of selfishness.Haven't we mastered it?I hope you can place yourself in the rabbit's place and feel some kindness.If people feel compassion,it's called "holier than thou".Playing around with words can't better your ethical argument.There is nothing like ethical meat and i doubt we must delude ourselves with "ethical animal testing" ideas. People like you amuse me the most. Your hypocrisy lies in your article itself. Actually, I wonder whether you realize that most of your comments in your 'analysis' are oxymoron? "I am all for testing, but I would never support cruelty to animals." Miss, do you understand the meaning of your own sentence? Its like saying "Oh, I love animals, but you know what?I wouldn't mind them slaughtered either!" These are the double standards which I fail to understand. Throughout your blog you are 'arguing' that how important it is for beauty industry to have its products tested on animals, doesn't matter whether the cost is lives of these poor 'lively' (stress on that) creature. And, can you please explain what exactly is "ethical testing?" Are you telling us that it is okay for animals to be administered painkillers or more harmful drugs so that their nervous system becomes dead and they can't feel whatever assault is done to them in the name of 'experiments'? And all this for what? Make up?Seriously? Just because a woman/girl/or whatever is insecure about his/her/whatever looks/personality, thousands of animals have to give up their lives? All for having mascara in their eyes or lipstick on their lips? Seriously? Are you that much heartless? I am not against makeup, but killing some live creature for testing the safety of a product is simply not justifiable or acceptable! i would rather wash my hair with vinegar (or whatever home remedy is available/feasible) than to buy a product which has been tested on animals. And your argument that The Body Shop is owned by L'Oreal and that makes its policy on 'cruelty-free makeup' as void is stupid. Companies like TBS might have parent companies which do not believe in compassion for animals, but that does not make their own customs irrelevant. No one has right to trade others lives. I guess that's why issues like trafficking and all are so sensitive. Because, NO ONE OWNS SOMEONE ELSE'S LIFE! Doesn't matter whether they are helpless/deprived people or animals. Every one has right to live on their own terms. If some day, such a situation arises, I from bottom of my heart wish that you should be the first person to be taken for an 'ethical test' (designed all by your understanding of a compassionate testing). It would be very much acceptable for those superior beings to test all the hazardous chemicals on you while you are kept in a cage isolated in god knows what condition. Everything is justified, no? Afterall 'beauty' ka sawaal jo hai!